Intravenous cannulation is a technique in which a cannula is placed inside a vein to provide venous access for the sampling of blood, as well as administration of fluids and other things. Intravenous is most commonly used venous access device. There is no absolute contraindications. However, cannulation should be avoided if possible in an injured, infected, or burned extremity. Intravenous cannulae are available in various sizes (16-24 gauge; larger the number, smaller the lumen). The different gauges vary in lumen sizes and length of the cannula. Different-sized cannulae have different colors for easy identification. Smaller gauge cannula is used in children [22, 24]. 18-20 gauge is used for most of the venous access procedures. Gauge 16 is the largest cannula and is used preferably in fast resuscitation and fluid replacement. For any patient, in general, the smallest size of the catheter that can be effectively used to deliver the prescribed therapy should be used. This minimizes the risk of damage to the vessel, ensures blood flow around the catheter, thus reduces the risk of phlebitis. However, In an emergency, the patient often requires large volumes infused over a short period of time. In such cases, the largest-gauge that is likely to fit the chosen vein should be used. Upper extremity is the preferred over lower extremity as it interferes less with patient mobility and carries lesser risk for phlebitis. Forearm is the usual site in upper limb especially the region where two tributaries merge into a Y-shaped form. The cannula is inserted in a straight portion of a vein to minimize the vessel injury. Tortuous or curved parts should be avoided. The veins of choice for catheterization include the cephalic or basilic veins, followed by the dorsal hand venous network. For prolonged courses of therapy, it is recommended to start from the distal site and move proximally when the change of catheter is required. The dirty skin should be washed beforehand with soap and water. The hair over the area should be shaved as adhesives would be used to secure the cannula. Local anesthesia should be used unless there is an emergency. The room should be adequately lit and warm enough so that vasoconstriction does not occur. Make sure the patient is in a comfortable position. A pillow or a rolled towel under the patient’s extended arm. Place a tourniquet over the patient’s nondominant arm, and select a site for IV catheter insertion. Infuse normal saline through a distal vein. This causes venous engorgement to allow placement of a more proximal large-bore IV catheter. when appropriate veins are not visualized or palpable. Difficult venous access may be encountered in diabetes, sickle cell disease, drug abuse history. Transillumination is another technique that can be used in patients with difficult IV access. Apply an antiseptic solution and let it air dry. Stabilize the vein with one hand by using thumb/fingers to apply traction to the skin distal to the chosen site. Stabilization should be maintained throughout the procedure. It protects the rolling of vain against the needle. Hold the cannula with the other hand the bevel facing upward. The angle of insertion would vary with the depth of the vein. As the needle enters into the vein, a giving way sensation is felt and blood appears in the flashback chamber of the cannula. At this moment, decrease the angle of the cannula to prevent puncturing the posterior wall of the vein, and advance it gently and smoothly for 2-3 mm. Hold the needle grip in place between your thumb and middle and slide the hub of the catheter over the needle and into the vein. Now release the traction on the skin. With this hand, hold the catheter in place with the thumb and index finger and apply pressure with the middle finger to prevent blood spill. A gauze can be kept under the hub of the cannula [see video below] to prevent the spoiling in case of a spill. With the other hand, withdraw the needle and secure the needle in its safety cover to avoid needlestick injuries. If any sample is required, it is taken by attaching the adapter or syringe. The confirmation of placement of cathter is done by withdrawing a small amount of blood to verify that the catheter is still inside the vein. Patency is checked by flushing the cannula with saline solution. As you push the fluid, do ask the patient if there is any pain. Ideally, the flush should not cause any discomfort. 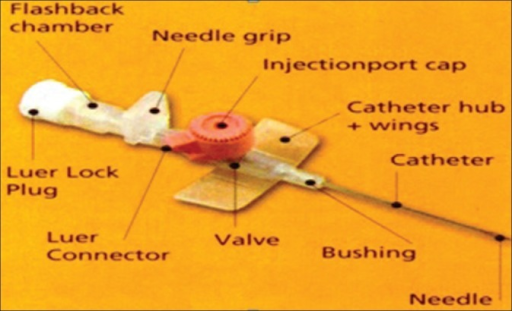 Secure the catheter to the skin using adhesive tape or readymade cannula securing kit. Then label it, indicating the date, the time, and other required information. Attempt insertion at a different site or re-attempt after correcting the probable cause. This occurs when the device has punctured the vessel. Release the tourniquet, withdraw the device and apply direct pressure. This step is done when the initial part cannula is inside the vein and advancement of the catheter is done while holding the stylet needle part. Release and then reapply the tourniquet to help engorge the vein. Connect a syringe with normal saline (0.9%) solution to the hub, then attempt to “float” the device in place by simultaneously flushing the catheter and advancing it. It can be caused by the catheter tip being against a venous wall or a valve, blood clot, or piercing of the venous wall. If the hematoma is there then removal is desired. Otherwise slight withdrawal and flushing may help. It is an unsual complication only when the vessel is mistaken. It can be caused by thrombus formation with subsequent inflammation, infection, or both. It is marked by pain, redness or induration and swelling. In severe cases, there may be drainage from the skin puncture site or palpable venous cords. It is a rare complication. Median nerve can get injured as it is located just posterior to the basilic vein in the antecubital fossa. Continuous infusion of solutions into a venous access device that extravasated into the surrounding tissue might result in a compartment syndrome. Some vesicant and irritant solutions may cause severe soft-tissue damage if they extravasate into the surrounding tissue. However, they can be given through a peripheral vein in emergency situations or when a central venous access is not readily available. Stop infusion solution and disconnect the tubing. Release the adhesive tape and transparent dressing from the skin. Withdraw the catheter outside of the vein and apply direct pressure with gauze for 5 minutes. Inspect the catheter for fragmentation* and document. Put a cotton ball with a paper tape over the IV insertion site. Instruct the patient to continue manual pressure for 10 more minutes. * To reduce fragmentation and catheter embolism risk, at the time of insertion, the needle after withdrawal should never be reintroduced into the catheter. Scales K. Intravenous therapy: a guide to good practice. Br J Nurs. 2008 Oct 23-Nov 12. 17(19):S4-S12. Atalay H, Erbay H, Tomatir E, Serin S, Oner O. The use of transillumination for peripheral venous access in paediatric anaesthesia. Eur J Anaesthesiol. 2005 Apr. 22(4):317-8.